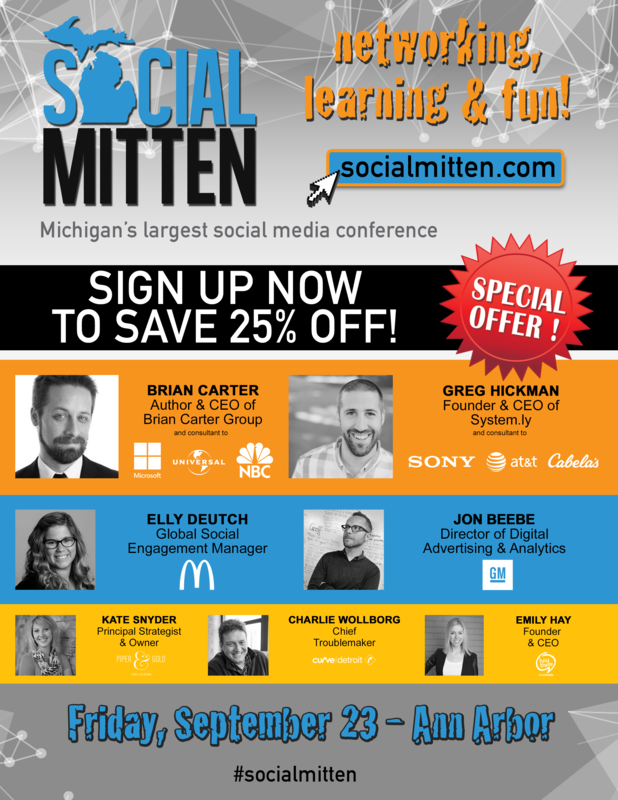 Michigan social media professionals are gearing up for a great conference coming to Ann Arbor this fall: Social Mitten. Dubbed “Michigan’s largest social media conference,” this must-attend event will take place on Sept. 23, 2016, and gather hundreds of social media enthusiasts from across the state to connect and learn. Conference goers will gain new techniques for digital marketing, and our team is ecstatic to be a part of the action — with our own Founder and CEO, Emily A. Hay, on board as a presenter. In addition to Hay, social leaders from GM and McDonald’s, and business owners with clients such as NBC and Sony, will be present to trade industry insight. If you’re looking to learn more about social media and network with like-minded professionals, the Social Mitten Conference may be a great fit. Visit Social Mitten and subscribe to email updates, or follow the #SocialMitten hashtag on Twitter to learn more. Early bird tickets are currently available – purchase them here. Hope to see you in Ann Arbor this September!